In two months, I'll be celebrating my 10th wedding anniversary. Ten years. A decade. In some ways it seems like a lifetime ago, but more often it feels like it was yesterday that we said, "I do." To celebrate, this summer we returned to the beach where we had our picture perfect wedding on an unseasonably warm and sunny October day 10 years ago. And as we showed our 5 year old twins the spot where Mommy and Daddy were married, my mind flashed back to the much colder evening when my now husband surprised me with the ring of my dreams and the promise of forever. In December of 2006, it wasn't really a question of if we would get engaged but when. We had built and moved into the house of our dreams and had a bedroom reserved as our future nursery. When Christmas came and went without a ring box in my stocking, I wasn't too disappointed. My birthday is on New Year's Eve so what more perfect opportunity? I tried not to be too excited but I got my nails done just in case. My now husband (then boyfriend) made reservations at a wonderful little restaurant, a cozy and romantic place that had been converted from a Colonial era home. This was it, right? We headed to the restaurant and I was excited and a little nervous. He seemed cool as a cucumber, and I started wondering if I had been wrong. I decided to just enjoy my birthday dinner and not think about it too much. Maybe I should have noticed that they had put us in a corner table, so that my back was to the entire restaurant. But I didn't. We enjoyed a wonderful dinner and I ordered dessert. I noticed that it seemed to be taking a while, but I never noticed that the entire restaurant staff was assembling behind me. Or that a harp player had come into the dining room and started to play. Nope. I was completely clueless. Then the waiter brought my dessert plate. And instead of the cheesecake I was expecting, there was a beautifully wrapped box. And even though I had thought this might be the night, I was speechless. I literally couldn't speak. Hands shaking, I started to unwrap the box. I looked up at my boyfriend and tears started streaming down my face. When I finally got the box open and saw my beautiful ring, the words still did not come. We just stared at each other for a long moment. No words were needed. Then someone in the restaurant called out, "Go ahead and kiss so we can pop the champagne!" It was the perfect light moment and we jumped up, embraced, laughed and kissed. He slipped the ring on my finger and our forever began. For the record, he did actually propose when we got home. We were both so overwhelmed at the restaurant that we forgot that part! The next day, after calling our parents, siblings, and friends, I was ready to start wedding planning. Even though I had been pretty certain we would be engaged soon I wanted to wait until it was official before I started making any plans. I was so excited to plan our dream day but there were so many things to think about! 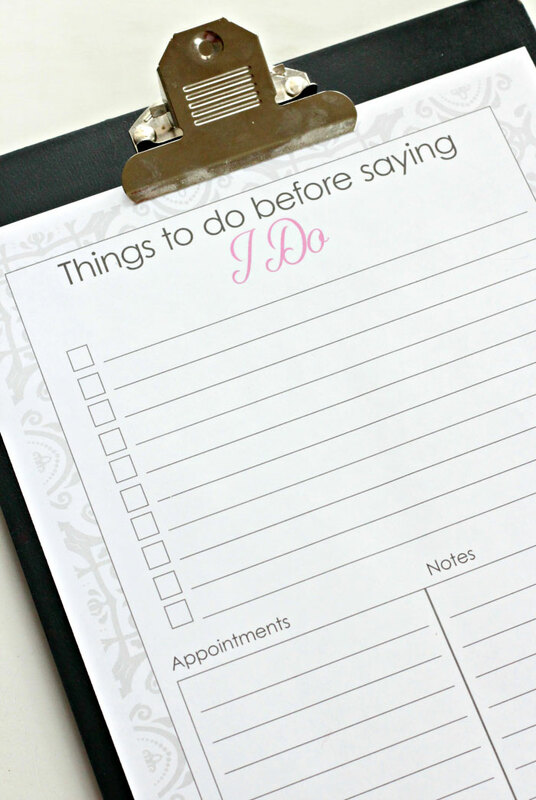 My first order of business was making a wedding to do list, and I've created a free printable one for all the brides to be reading this today. Wedding planning involves so many details and I found it super helpful to keep them all in one place (my wedding binder was EPIC. I still have it.). This blank to do list is the perfect way to get started - it has a spot for you to write your tasks to complete, appointments to keep, and any notes you need to remember. 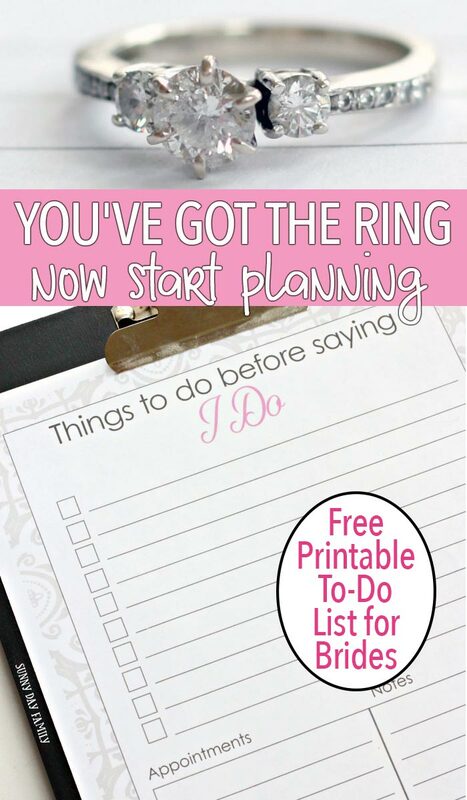 Download it for free below, then print as many as you need to stay organized - you might need a new one every week or even every day as your wedding approaches. Simply click the button below to grab yours and get started. One of the first things that I did when I got engaged was to insure my new ring. And I am so glad that I did! 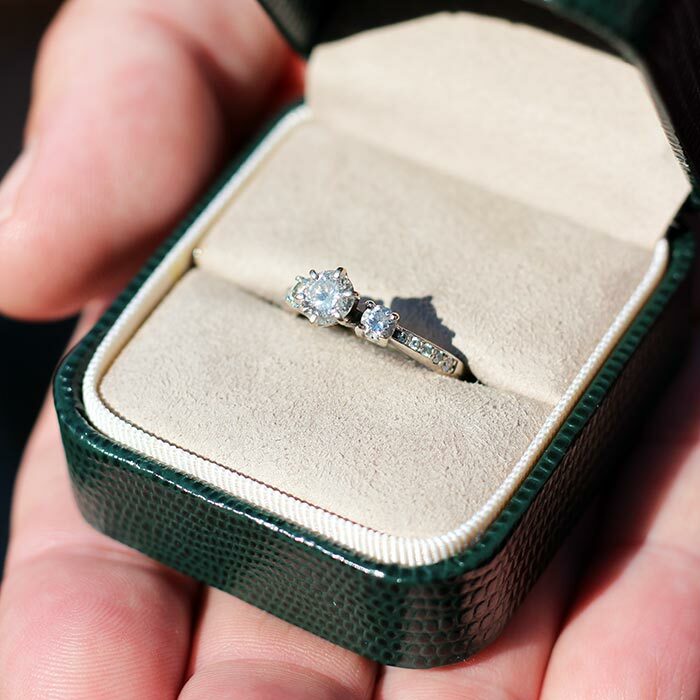 A few years later, I lost one of the diamonds from my engagement ring while we were on a Caribbean cruise. Thanks to the fact that my ring was insured, I knew that I would be able to replace the diamond and our vacation wasn't ruined. My ring is as good as new again. 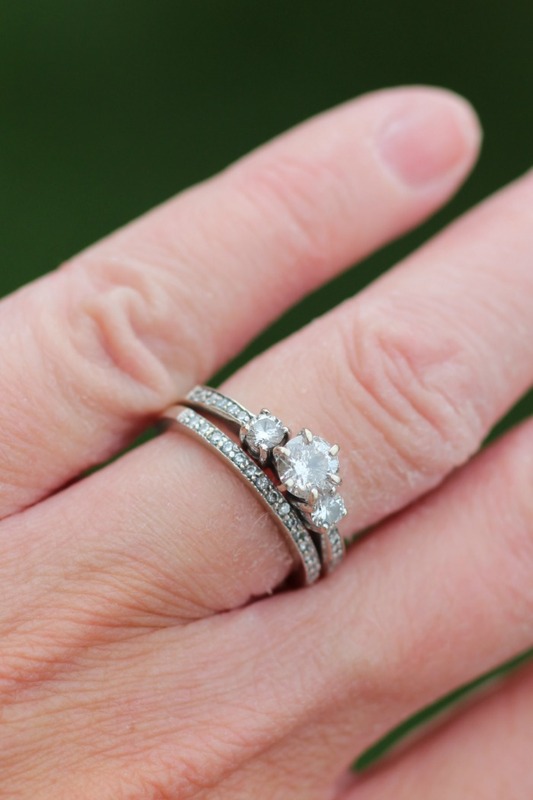 If you're newly engaged or you've been married for a while, you can get all the information you need with Jewelry Insurance 101 from Jewelers Mutual. 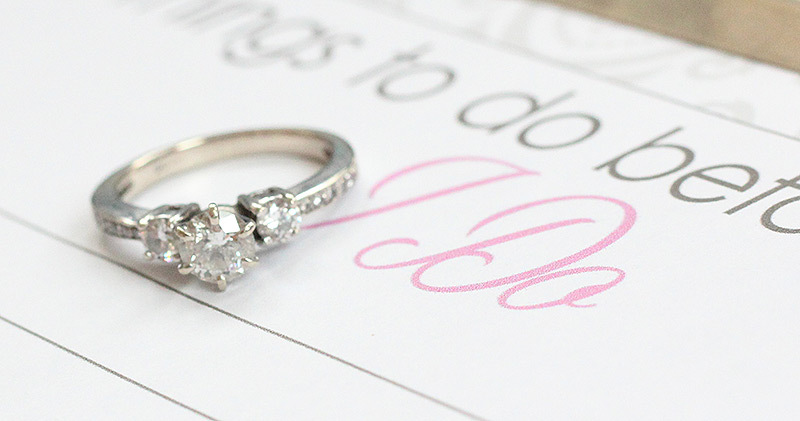 Jewelers Mutual is the specialist in jewelry insurance, and will give you peace of mind that your dream ring will be safe and sound (so you can concentrate on your wedding plans). Plus you can get a free online quote quickly and easily. Get a free jewelry insurance quote here and see for yourself. And if you're still thinking about getting engaged, Learn what brides-to-be want in an engagement ring here (feel free to share with that special someone). What's your engagement story? I'd love to hear about it in the comments below!